I do my best to deliver quality translations. I love working on terminology research. English to Portuguese: O perigo real do pelagianismo. Pelagianism takes its name from an austere monk, most likely of Irish descent, named Pelagius. He died around 418. He should not be confused with the two Popes who shared this same name. Pelagianism can simply be thought of as the self-help heresy. It essentially “denies the elevation of man into the supernatural state, and denies original sin. According to Pelagians the sin of Adam affected his descendants by way of bad example only” (Ott, pp. 222-3). This means that Christ’s saving work of redemption consists above all in His teaching and His example of virtue. For Pelagius, Jesus was just a great teacher as was Moses before Him. Furthermore, “Pelagianism regarded grace as within the natural capacity of man.” According to this view man has a natural capacity to live a sinless and holy life and merit eternal bliss by exercising his free will. The Pelagians believed this natural capacity was aided by external graces given to us by God… things like the Mosaic Law, the Gospel, the example of virtue set by Our Lord and His Mother and others. This means that man can achieve even the remission of his sins by his own power, by the act of turning his will away from sin. This makes Pelagianism pure naturalismo. O nome pelagianismo deve-se a um monge austero, muito provavelmente de origem irlandesa, chamado Pelágio. Ele faleceu por volta do ano 418. Não devemos confundi-lo com os dois Papas que tiveram este mesmo nome. O pelagianismo pode ser concebido simplesmente como a heresia da autoajuda. Ela essencialmente “nega a elevação do homem a um estado sobrenatural, e nega o pecado original. De acordo com os pelagianos, o pecado de Adão afetou os seus descendentes apenas por meio do mau exemplo” (Ott, pp. 222-3). Isso significa que o trabalho salvífico de redenção de Cristo consiste acima de tudo em Seu ensinamento e Seu exemplo de virtude. Para Pelágio, Jesus foi apenas um grande mestre, assim como Moisés antes Dele. Além disso, “O pelagianismo considerava a graça como algo dentro da capacidade natural do homem.” De acordo com essa visão, o homem tem uma capacidade natural de viver uma vida santa e sem pecado e merecer a felicidade eterna ao exercer a sua vontade livre. Os pelagianos acreditavam que esta capacidade natural era auxiliada por graças externas que nos foram dadas por Deus… coisas como a Lei Mosaica, o Evangelho, o exemplo de virtude estabelecido por Nosso Senhor e Sua Mãe, entre outros. Isso significa que o homem pode alcançar até mesmo a remissão de seus pecados por seu próprio poder, pelo ato de afastar sua vontade do pecado, o que torna o pelagianismo um puro naturalismo. Experience Years of translation experience: 20. Registered at ProZ.com: Oct 1999. Became a member: Sep 2013. 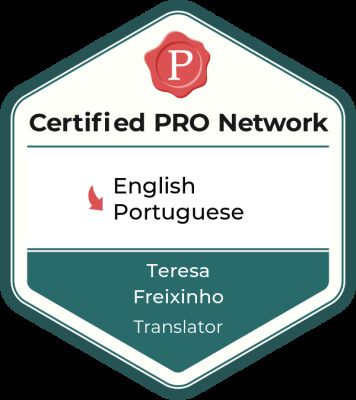 Professional practices Teresa Freixinho endorses ProZ.com's Professional Guidelines (v1.1). I have been a professional translator for about 16 years. 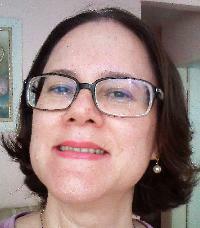 I translate from English into Brazilian Portuguese. Although I have translated some books, most of my experience revolves around technical translations in legal, business and corporate fields. My areas of expertise include law, business, corporate affairs, trade, management, human resources, government, European Union issues, environment, culture, history, bioethics, religion, etc. - magazine/newspapers articles on politics, economics, history, education, culture, Catholicism etc. I hold an Elementary Teacher Formation Certificate and a Bachelor's Degree in Philosophy. Moreover, I studied English for several years at the most distinguished English school in my city. I also studied other foreign languages, such as Spanish and German. - Certificate of Proficiency in English by the University of Cambridge. 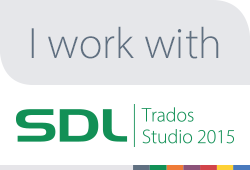 CAT Tools: I currently use Trados Studio 2015. It is my favorite CAT tool. However, I have also tried other CAT Tools, such as Wordfast Classic and Wordfast Anywhere.